While many scoffed at her May-December affair with badminton player Gerald Sibayan, Comedy Concert Queen Ai Ai delas Alas maintains that her boyfriend’s parents are not averse about their romance. “Okay naman sila [sa amin]. Basta sinasabi nila parati kay Gerald na ‘Malaki ka na, alam mo na 'yung tama at mali,’” she said in an interview with Boy Abunda on The Buzz which aired Sunday. The couple’s romance had been the subject of much curiosity some months back, but it was only last September when Gerald confirmed that they are officially together. What’s more is that Ai Ai’s kids, Sancho and Sophie, both approve of their mother’s newfound love. Ai Ai, during her interview, claimed that Gerald had been nothing but an answered-prayer when he came into her life. “Pinag-pray ko ito. Pero nakipag-date din ako before sa kanya. Nag-pray ako kay Lord na ‘Sana bigyan niyo naman po ako ng ganito, ganito, ganito, ganito,’" she replied after Buzz host Boy Abunda asked her how their relationship is doing. "Nakalimutan ko 'yung edad. Pero swak sa lahat. Nakalimutan na sana medyo ka-edad ko pero okay na lang din,” she added in jest. Gerald is actually 30 years younger than Ai Ai. While she has had a turbulent relationship prior to Gerald, Ai Ai is very much grateful that she found “inner peace” through her current relationship. “Napaka-thankful ako kay Lord na binigyan niya ako ng chance na maging maganda pa rin at this age. Kahit 'yung hindi magandang maganda, 'yung fresh na lang. 'Yung inner peace ko talagang thank you Lord sa lahat,” she said. 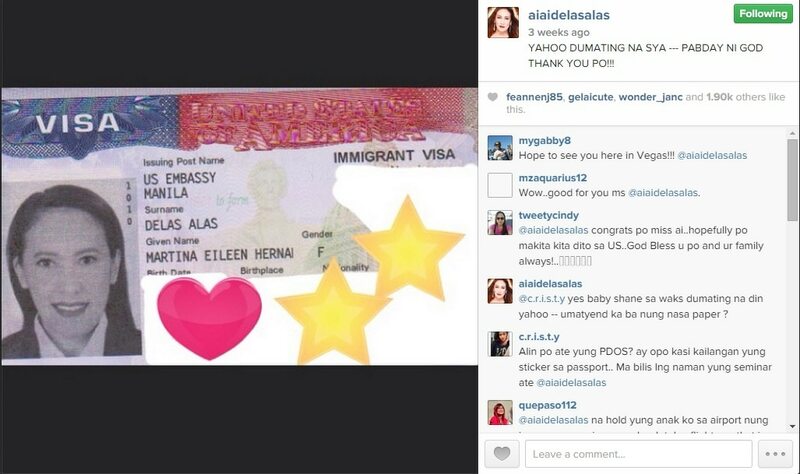 Meanwhile, Ai Ai recently stirred speculations that she could be leaving the country for the US for good after posting a photo of her immigrant visa recently. Ai Ai reasoned that she is going to do it for her kids. “’Yung dalawa kong anak, doon po nakatira so kailangan ko silang dalawin every time,” she said.